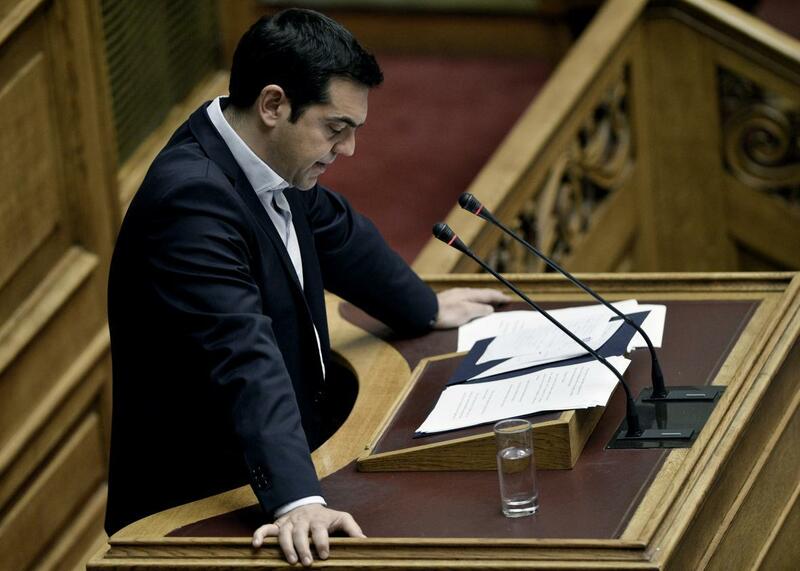 Greek Prime Minister Alexis Tsipras delivers a speech during a parliamentary session in Athens on June 28, 2015. After hours of contentious debate and amid violent street clashes outside, Greece’s parliament did eventually approve a set of new austerity measures meant to assuage the country’s European creditors, and hours later, the European Central Bank moved to resume funding of the Greek banking system. But in the process, Alexis Tsipras’s government may have been dealt a fatal blow—which is ironic, as the left-wing prime minister doesn’t even support the measures he pushed through last night. Sixty-four of Greece’s 300 members of parliament, including several cabinet ministers, opposed the measures, which included tax increases and raising the retirement age. Half of those “no” votes came from members of Tsipras’s Syriza coalition, who joined with the Communists and the fascist Golden Dawn party to oppose their own leader. Tsipras had to rely on the support of the centrist parties he ousted in elections earlier this year to get the measures passed. The opposition says Tsipras can rely on their support for the second round of austerity measures Greece will vote on next week as a condition of the bailout, but beyond that, there are no guarantees. Without a majority, Tsipras will have to either form a new unity government or call for new elections—likely in the fall. Syriza’s activist base seems confounded by the once-defiant prime minister’s acceptance of the bailout, unsure whether he’s sold out, is being manipulated by the centrists and neoliberals advising him, or has simply been browbeaten into submission by the troika. This “blackmail” that you refer to, do you believe it is real or imagined? If you believe it is imagined, then I am open to alternative options, and we can go forward that way. If, however, you believe the blackmail is real, then there is no other option than for all of us to share the burden of this responsibility. Tsipras’ fear of what would happen if the Greek economy were cut off from its financial lifeline entirely is understandable. But I would imagine the prime minister is still marveling at the fact that he may be sacrificing his job for defending the very thing he took the job to oppose.